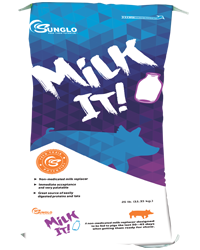 Milk It!™ replacer is available in a 25 lb bag for easy and economical on-farm use. Great source of easily digested proteins and fats. 20% Protein and 20% Fat. More versatile in feeding program. Always transition slowly from one ration to another to help avoid. DRY: Feed 1/4 to 1/2 lb per pig for the 30–45 days prior to show. LIQUID: Mix milk replacer powder at the rate of 1/2 lb (8 oz dry powder) per 2 quarts water. Milk It!™ replacer is not a recommended milk replacer for small, pre-weaned pigs.